There are many healthy diets for teenagers wanting to lose weight. However, it's important that teens follow the advice of their doctors and diet under the supervision of a parent or other responsible adult. The sad reality is that many of today's children and teens are overweight or obese. Whatever the reason for this, it has been deemed an epidemic and is a serious health risk to boot. If your teen is facing excess weight or obesity, it's important to address the problem in a healthy way. 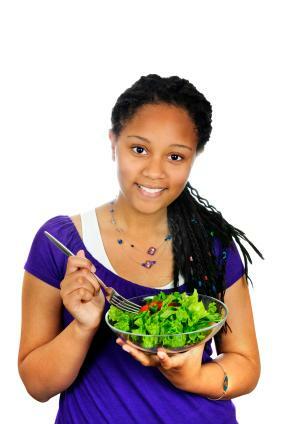 Consider these tips when searching for healthy diets for teenagers wanting to lose weight. Consult a doctor. In some cases, excess weight may be a sign or symptom of a larger medical condition. It's important to rule out any medical issues before pursuing dieting. Visit a Nutritional Consultant. Registered dieticians, certified nutritionists, and weight loss coaches are trained to address these kinds of medical problems. Additionally, these professionals can create an eating and exercise plan that fits into your teenager's busy lifestyle, incorporating foods and physical fitness that he or she enjoys. Consider Weight Watchers. Weight Watchers offers an online program and a group-based program. The benefit of both of these programs is that you and your teenager can follow this points-based program together. The plan is flexible enough to work for all phases of a healthy diet, whether that's weight loss or maintenance. Additionally, the Weight Watchers program emphasizes the idea of all foods in moderation, which may work well for teenagers. Try Weight Loss Camps. While weight loss camps and other adolescent weight loss programs have earned a poor reputation, many of them offer children camaraderie and positive messages about body and self at a time when they may not be feeling good about themselves. All this is in addition to the nutritional and exercise advice they will learn. Just be sure to do your research and talk to your child or teen before sending them to weight loss camp. Many diets are considered inappropriate for children and teens because their bodies are still developing. Some diets can lead to nutritional deficiencies, cause lethargy, and even more serious illnesses. Be sure to talk to your doctor before encouraging your child to try new diets. Here are a few diets that you may have considered trying for your teen. However, read on to learn some of the not-so-positive side effects of these types of diets. South Beach Diet - Though the South Beach Diet is considered healthier than many of the fad diets out there, it still restricts certain food groups while trying to stabilize blood sugar, which can have a negative impact on growing children and teens, especially as they are still growing and developing. Atkins Diet - Famous for its emphasis on protein and fast weight loss, Atkins is one of the leading fad diets of today. Unfortunately, by overemphasizing protein and under-emphasizing grains and other carbohydrates, the diet can be downright harmful for some individuals. Children and teens should generally avoid low carbohydrate diets like this. Cookie Diets - There are several of these fad-based diets on the market today. As alluring as they might be to a young person, these diets are expensive and massively restrict basically all of the important food groups, supplementing the diet with vitamins and synthesized amino acids. These diets are not appropriate for young people. All in all, the healthiest diet for the child in your life is one that includes foods from all of the food groups. Balance with food and fitness is crucial to achieving and maintaining a healthy lifestyle. Eating disorders are especially prevalent among teens, especially teen girls. If you believe your teen may have an unhealthy preoccupation with losing weight, contact professional help.